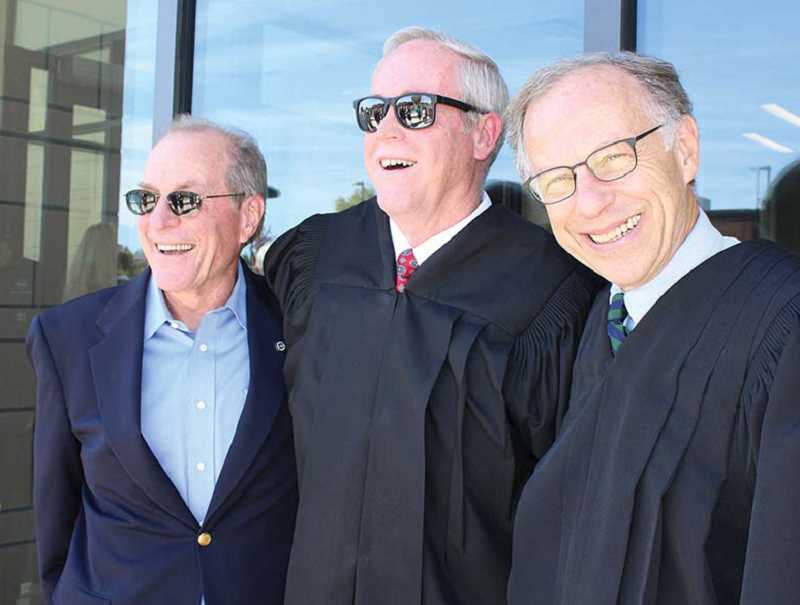 Retiring judge also served as county judge and as an attorney over his 33-year career. During his 33-year career as an attorney, county court judge, and Circuit Court judge, Daniel Ahern has been known for his administrative abilities, and respect for errant people's ability to turn their lives around. March 29 will be Judge Ahern's last official day on the bench, as he retires at age 60, but as his replacement has not yet been appointed, he will continue temporarily. Three area candidates have applied for the position, and Gov. Kate Brown will interview and appoint the new judge. "Sixty is the youngest they let judges retire, and afterward, they are required to work seven weeks a year for five years. They can send us anywhere in the state to fill in for judges on vacation, etc.," Ahern said, noting he is looking forward to the travel and variety that will entail. Born on St. Patrick's Day in 1959, Ahern moved to Madras at age 4, and grew up working at his parents' grocery store and delivering newspapers. He graduated from Madras High School in 1977, where he was a standout athlete in basketball and cross country, and met his future wife, Fran Moses. He graduated from Reed College in 1982, and the University of Oregon Law School in 1985. 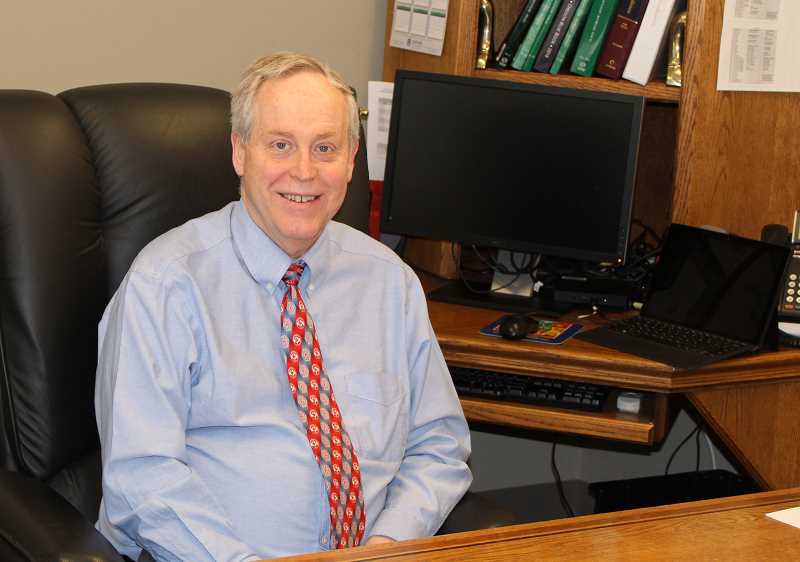 After passing the state bar exam in September 1985, he joined the practice of Madras attorney Paul Sumner as an associate attorney, and found he enjoyed working in his hometown. In 1988, at the age of 29, he successfully ran for the position of county judge on the Jefferson County Court (now known as the County Commission). "I ran because the county judge then was over juvenile cases, and my interest was in working with juveniles," Ahern said. Although the title was "judge," he noted, "The county judge didn't have to be an attorney, and I felt it was important to be an attorney when doing juvenile cases. I loved it. It was the best job I ever had. You were a county administrator, chairman of the county court; I got to practice law as a juvenile judge, and do public service as a commissioner," he recalled. During his 7 1/2 years working for county government, the commissioners tackled many big projects. "When I first started, the landfill was free and people dumped everything, and animal control was either killing dogs or selling them to laboratories. The first thing we did was change the animal control and landfill policies," he said. "We built a new senior center, and developed Juniper Hills Park, which was just a field. The park was also the subject of a recall attempt against Rick Allen and I, because we supported it," he said, noting the recall was unsuccessful. "Dan was a very common sense type person, and I enjoyed working with him immensely. It was a good experience and Dan's leadership was really important on all the projects," said Allen. One big challenge was trying to get voters to pass the county's operating levy every year, until finally, Salem passed legislation that provided a tax base for counties. At one point, the other two commissioners — Allen and Ron Vincent — voted to change things so juvenile cases were not the commissioners' responsibility, and they were handled by Circuit Court. However, that created an opportunity to add a third Circuit Court judge (in the Second Judicial District), and Ahern decided to seek that position. With backing from Rep. Bev Clarno, the hiring of a third judge was approved, and in 1996, Daniel Ahern was appointed by Gov. John Kitzhaber as a Circuit Court judge. Later, in 2010, he became the Second Judicial District's presiding judge, when Judge George Neilson retired. The district covers both Jefferson and Crook counties, and Ahern works Monday and Tuesday in Prineville, and Wednesday, Thursday and Friday in Madras. "It's like two different jobs; both counties are so different," he said. Asked about some of the big cases he covered during his career, Ahern replied, "What I remember is people rather than big cases. I liked juvenile cases because you get to know the kids so well, you get vested in them. You keep hoping delinquents will turn it around and do well." "I was also a Drug Court judge for 10 years, and I still see people in the store, who come up to me and say they are still clean and are proud of it. That feels pretty good. I always hope they will turn around," he said, noting, "A lot of them only get in trouble once." Another rewarding aspect has been doing adoption ceremonies for children who had to be taken away from abusive parents. "The focus is supposed to be on the kid, not the parents, and a kid deserves a loving home. To do an adoption ceremony and see kids adopted by a loving family is really rewarding — to see a kid who didn't have a chance and is doing really well now," he said. Ahern said his wife, Fran, retired four years ago, "And I'm ready to join her." She worked at the Warm Springs Community Center, then for the last 18 years was the recreation director at Kah-Nee-Ta Resort. The Aherns have three children, Susan, who has a master's degree in education, and is a homemaker with their two grandchildren in Washington; Marissa, who has an architecture degree from the University of Colorado and is taking a web-based master's program through Penn State University while working as the project manager of a retail shop area in Warm Springs; and Robert, who is attending John Hopkins University in Washington, D.C., and works as a Congressional liaison for the National Indian Health Board. In the community, Ahern serves on the Jefferson County Scholarship Committee, directed the George Wilson Memorial Run for 20 years, is a lifelong member of St. Patrick's Catholic Church, enjoys running and has run several marathons. A sports fan, he said he tries to go to a Boston Red Sox game once a year, and plans family trips around Red Sox games. In retirement, the Aherns plan to stay in Madras, but do more traveling. "As a judge, I'm on call 24 hours a day, seven days a week for search warrants, and I'm looking forward to not having to do that," he said. Praising his staff, Ahern noted he'd only had three secretaries his whole career, Judy Sumner, when he was an attorney, Donna Cloud, when he was county judge, and Linda Branson for over 20 years as a Circuit Court judge. "I have a phenomenal staff of workers, and that makes my job easier in both counties," he said. Reflecting over his career, Ahern said his parents, Barney and Patricia Ahern, were his biggest role models. "My parents and working in the store were my best teachers. When you work in retail, you learn how to treat customers, because they don't have to come to you," he observed. That experience influenced the way he approached defendants in the courtroom. "If you treat people like a customer, it helps with better outcomes," he said, adding, "If everybody in government had to work retail first, we'd have better government." Wade Whiting, the Crook County district attorney, began his career in the district as a defense attorney, then worked as a prosecutor in the Jefferson County District Attorney's Office before getting the appointment to serve in Crook County. He has worked before Judge Ahern for nine years. "I have the utmost respect and admiration for the job he has done as our presiding judge," said Whiting. "While the law is written in black and white, many cases land in the gray area because of the unique individual circumstances involved. These are the cases where Judge Ahern excels the most." Whiting praises Ahern's humor and thoughtfulness. "While not every ruling went my way, I knew Judge Ahern carefully considered the arguments of each side and ruled in the interest of true justice. I will truly miss him on the bench." Jefferson County District Attorney Steve Leriche said what he appreciated about Ahern as a judge was, "He was always a gentleman to everyone who appeared before him; he had a good sense of humor, and at sentencing, what was good for Madras and Jefferson County played a part in his decision. He gave a sentence that would help the person be a better citizen." "I've known him for over 20 years as a person, family man and member of the community, and he's one of the most beloved individuals in Madras. To be able to do the job he has done for so long, and to be so fondly thought of by so many is a remarkable achievement," Leriche said.